Separate cross sections of all walls. Each cross section should clearly show the size of block used (i. e. 4, 6, 8, or 10 inch) for the building inspector and installer. Each cross section should show the wall heights involved for every storey. 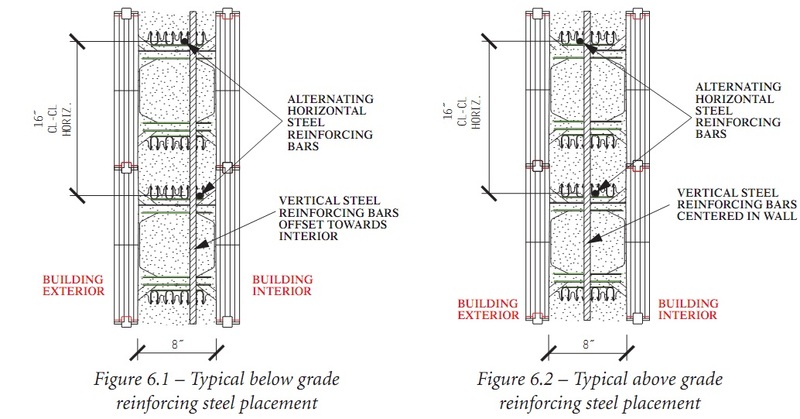 Vertical and horizontal reinforcing steel bar sizes, spacing and grade of steel should be clearly marked for every storey in each wall cross section or in a separate note on other sheets. The placement of reinforcing steel, especially the vertical ones should be clearly marked (i.e. off center or towards interior/exterior or centered in the wall). The designer should specify the lap splice type and lengths for every section of the wall where splicing is anticipated. Plain concrete is a strong material in compression. Compressing a plain concrete cube or cylinder requires a relatively large amount of compressive force before reaching compression failure. However plain concrete is relatively weak in tension (typically can only carry one tenth (1/10) of its compression strength in tension). Amvic polypropylene webs are specifically designed to accommodate and secure the horizontal reinforcing steel in place without the need to tie them. Typically the first course of horizontal reinforcement is placed in the notches closer to the EPS panel. The second course of horizontal reinforcement is staggered so that it is placed in the notch towards the center of the concrete wall. The third course is placed in the same position as the first course. The fourth course is placed in the same position as the second. This staggered pattern of horizontal reinforcement is necessary to allow for the vertical reinforcement to be placed from the top and weave in between the horizontal steel bars. below grade and above grade applications using 8" respectively. Vertical reinforcement is placed after the wall has been stacked and completely erected. 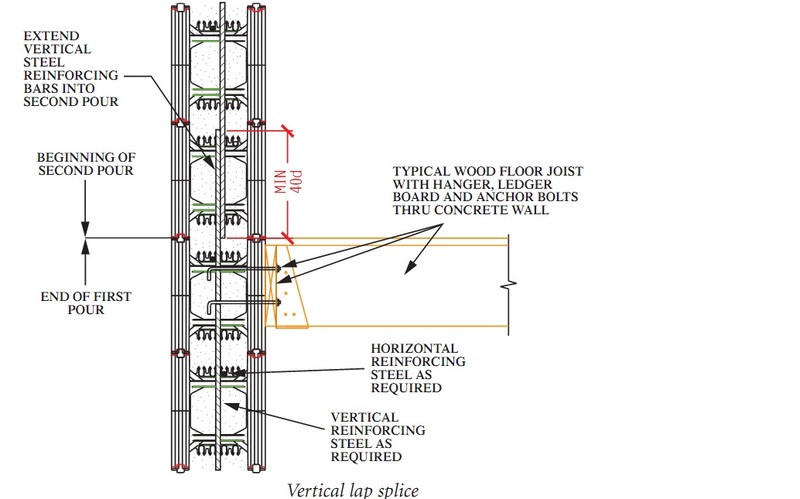 In case of a multistory wall then the vertical reinforcement is placed after the erection of each individual storey. Vertical reinforcement bars are slid into place from the top and weaved into the horizontal reinforcement and secured into the proper place according to the project plans and specs. Most walls will have window or door openings or both. Creating a wall opening in a reinforced concrete wall creates extra stress around that opening especially at the corners. Window and door headers also known as lintels can be subjected to significant bending moment and shear forces depending on several factors. Steel reinforcement typically comes in 20 foot (6 meter) lengths. In such cases where steel reinforcement is required to exceed this length, then a splice is required. The main purpose of the splice is to transform the stresses whether tensile or compression from one steel reinforcing bar or a group of bundled bars to another in a manner to satisfy the governing local building/engineering codes and/or requirements of engineering plans and specs. For the purpose and scope of this manual we will only discuss one type of splicing known as lap splicing. 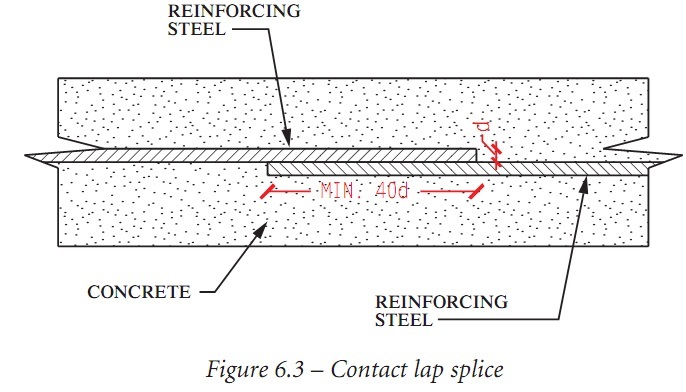 Lap splicing is typically overlapping reinforcing steel over a certain length. The length of the splice should be calculated according to the local building codes or by a local engineer and specified on the project plans. 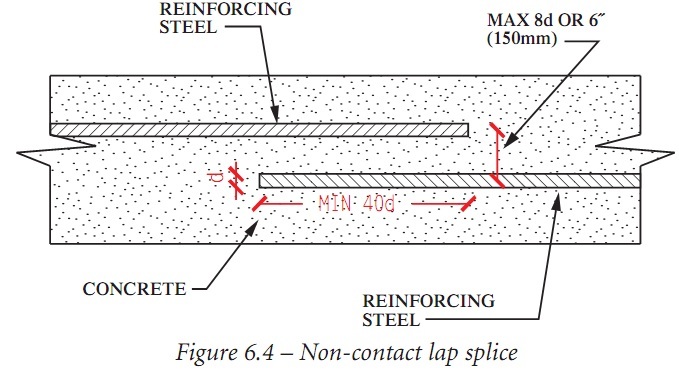 The lapped reinforcing bars MUST be in contact with each other and secured together. The reinforcing bars are allowed to be spaced at a distance of one fifth (1/5) of the lapped length to a maximum of 150 mm or 6 inches. When a project has more than one storey of walls, it is necessary for the installer to understand how to perform vertical reinforcement lap splices between the different pours. There are two options, both of which are satisfactory from an engineering/structural standpoint. Extend the vertical reinforcement steel bars beyond the top level of the lower storey. The length of the extension should be equal to the required splice length specified by the design engineer or a minimum length of 40d (where d = diameter of smaller steel bar being spliced). Please refer to figure 6.5 below for typical details. Cut the vertical reinforcement steel bars for the lower storey so that they are flush with the top of that wall. Shortly after pouring the concrete, wet set additional vertical reinforcing bars also known as dowels into the concrete. These should extend into the freshly poured wall a length equal to the splice length specified by the design engineer or a minimum length of 40d (where d = diameter of smaller steel bar being spliced). 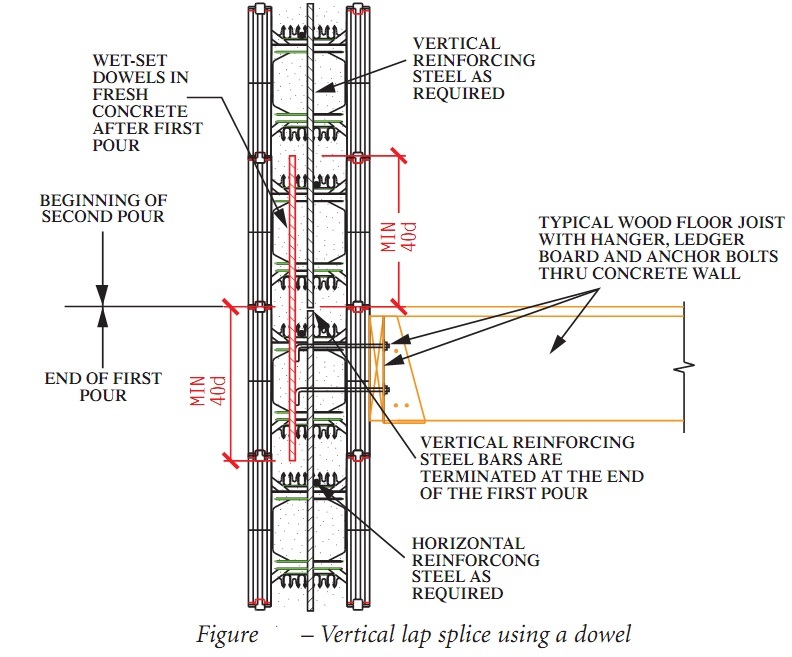 The wet-set vertical splice reinforcing steel bars should ALSO protrude into the upper wall by the same splice length specified by the design engineer or 40d as a minimum. Please refer to figure 6.6 below for details. Determining the reinforcing steel schedule whether vertical or horizontal is a structural engineering task which depends on many factors. This is beyond the scope of this technical manual, however, some tools are available for the residential construction market to assist in reinforcing steel design. The tools are explained below. CCMC report no.13043-R contains reinforcing steel tables for below grade and up to 2 storeys of above grade applications in residential projects. The report also contains some lintel tables for wall openings both in metric and imperial units. There are applicability limits mentioned in the report which must be adhered to. A - Design of reinforced concrete shall be in accordance with CSA A23.3. B - Reinforcing steel placement shall conform to CSA A23.1, CSA A23.4 and/or the local building code having jurisdiction. C - Reinforcing steel bars shall conform to clause 7 of CSA A23.1 AND CSA G30.18. D - Minimum Steel Yield Strength shall not be less than 300 MPA (40 ksi). NAHB (National Association of Home Builders) in association with PCA (Portland Cement Association) have prepared the "Prescriptive Method for Insulating Concrete Forms in Residential Construction" specifically for the ICF industry [REF. 1]. This document contains reinforcing steel schedules forbelow grade and up to 2 storeys above grade applications. It also contains several lintel tables for wall openings in different applications. As expected, there are limitations which must be adhered to. A - Design of reinforced concrete and placement of reinforcing steel bars shall be in accordance to ACI 318 or ACI 332 and/or the local building code having jurisdiction. C -Minimum yield strength of reinforcing steel shall be Grade 40 (300 MPa) except for seismic design categories D1 & D2 the minimum yield strength of reinforcing steel shall be Grade 60 (400 MPa). For applications that fall outside the scope of the "Prescriptive Method" a local licensed/registered engineer should be retained. PCA (Portland Cement Association) has prepared another tool for engineers to assist in the design of ICF walls - "Structural Design of Insulating Concrete Form Walls in Residential Construction" [REF. 2]. 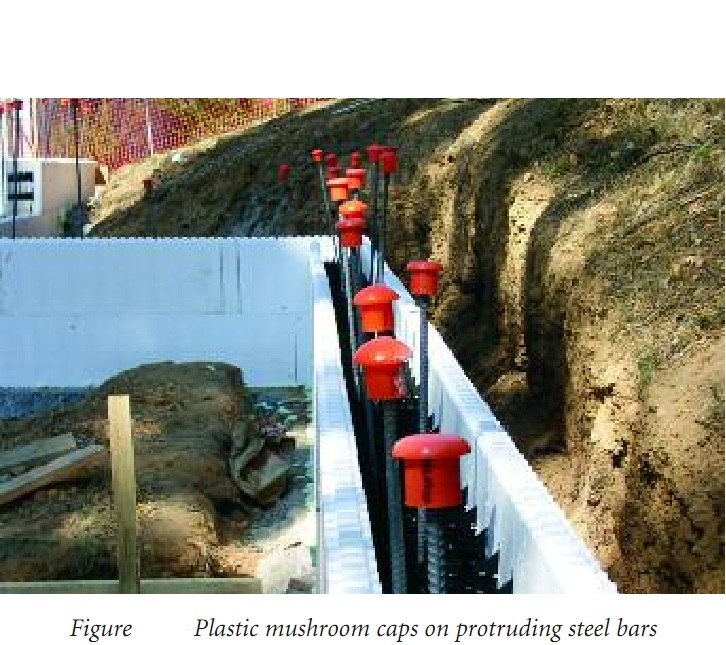 This publication explains in more detail the engineering principles involved in design load bearing and non-load bearing ICF walls even for walls outside the scope of "The Prescriptive Method". Bend reinforcing steel so exposed ends are no longer upright. When employees are working at any height above exposed rebar, fall protection/ prevention is the first line of defense against impalement. According to OSHA (Occupational Safety & Health Administration - USA) article 1926.701 (b), the following clause shall apply to the job site: "All protruding reinforcing steel, onto and into which employees could fall, shall be guarded to eliminate the hazard of impalement." A similar compliance clause present in OSHA (Occupational Health and Safety Act - Canada).